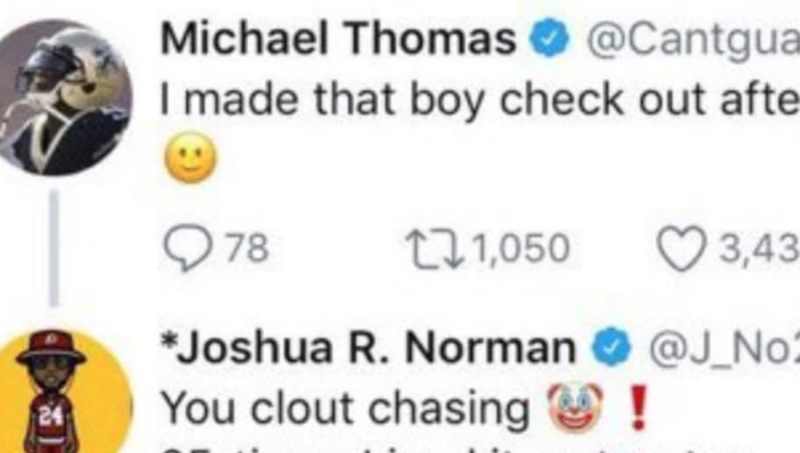 ​And yes, of COURSE ​Josh Norman deleted his end of the exchange. Following a Monday night massacre, Saints wide receiver Michael Thomas had every motivation in the world to stay up late chirping. After all, his remarkable season continued at Washington cornerback Josh Norman's expense, leaving the man so befuddled that he couldn't properly ​take his jersey off. Thomas showed up to this fight first, letting Norman know he barely even played a role in this trash. ​​"And I'm going to bully you ever(y) time I see you, just so you know" is an all-timer. Naturally, Norman's tweets are now gone. ​​How dare you, Joshua? This night was supposed to be a celebration of the GOAT passing yardage leader Drew Brees getting his rightful due, and somehow we're now discussing the semantics and line-by-line breakdown of Josh Norman's coverage. Can't we all agree that, even if Pro Football Focus backs up the stats he's trying to quote to Thomas, that he wasn't very good? That his team was very bad, in fact? That would be nice. Actually, you know what? Never tweet at all.